Xigmatek introduces its Gaia II (left) and Loki II (right). Gaia II features three direct-touch 8mm diameter copper heatpipes, an aluminium fin tower heatsink, and a 120mm PWM fan that delivers up to 56.3CFM. The cooler measures 120mm x 159mm x 50mm (W x H x d) and weighs 460g. It's a mid-range cooler that can handle a maximum heat output of 150W. Loki II on the other hand is designed for thermal loads of up to 130W. 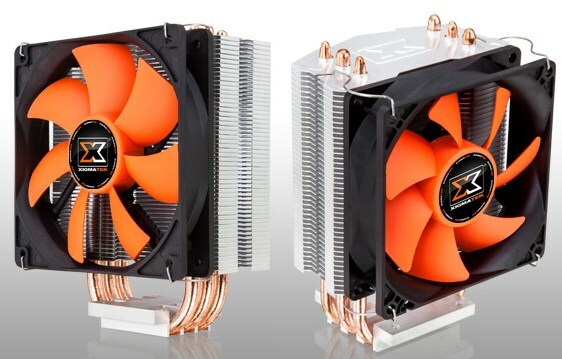 It features three direct-touch 6mm diameter copper heatpipes, an aluminium fin array and a 92mm PWM fan that delivers up to 52CFM of airflow. The HSF measures 92mm x 134mm x 50mm (W x H x D) and weighs only 330g. Both coolers support Intel LGA1150/LGA1155/LGA1156, LGA1366 and AMD AM3+/AM3, and FM2/FM1 processors. Pricing is unknown but it's likely close to the price range of the first-generation Gaia and Loki models, which is $30 and $25, respectively.